Mara Hoberman: Do people leave things behind, little mementos, either evidence of their own work or just even personal items? Thomas Fougeirol: It’s funny; it’s really like a photogram. The darkroom is like a plate and everything that people leave behind gets imprinted there. Jo-ey Tang: In that sense, the darkroom retains memories from all the different people who have used it, who have passed through this darkness, alone together. 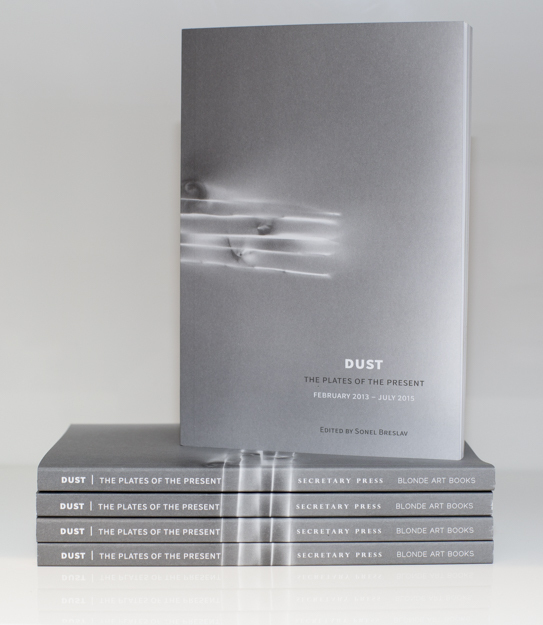 We are so pleased to announce the launch of Blonde Art Books’ second publication, Dust: The plates of the present, February 2013 – July 2015 published by Blonde Art Books and Secretary Press, including images from the archive of the artist-run darkroom residency based just outside of Paris, as well as text contributions by Robin Cameron, Thomas Fougeirol, Mara Hoberman, Flora Katz, Brett Littman, and Jo-ey Tang. The book is published alongside an exhibition of the archive curated by Sonel Breslav at Baxter Street at the Camera Club of New York. The book will also be available for sale at table N36 at the New York Art Book Fair, September 17-20, 2015. (2013) G. William Webb, J. Pasila, Allison Somers, Marina Faust, Joy Episalla, Shanta Rao, Carrie Yamaoka, Ofer Wolberger, Munro Galloway, Bettie Nin, Raffaella Della Olga, Madeleine Aktypi, Robin Cameron, Benoit Fougeirol, Cécile Dauchez, Drooid5z, Ben Dowell, Nickolaus Typaldos, Nathan Gwynne, Emmanuel Van Der Meulen, Camila Oliveira Fairclough, Sonja Engelhardt (2014) Davide Cascio, Delphine Trouche, Daiga Grantina, Carlos Reyes, Agnes Lux, Jiajia Zhang, Zoe Paul, Chloé Quenum, Jean-Baptiste Maitre, Joe Namy, Jesus Alberto Benitez, Mimosa Echard, Antoine Barberon, Renaud Regnery, Thomas Fougeirol, Yonatan Vinitsky (2015) Anne Laure Sacriste, Antoine Donzeaud, Hubert Marot, Julien Bouillon, Lorraine Châteaux, Loup Sarion, Sylvie Fanchon, Jean-Luc Blanc, Laëtitia Badaut Haussmann, Nancy Brooks Brody, Mo Husain, Sergio Verastegui, Julien Carreyn.